Can you believe that up until Thursday afternoon I wasn't aware of this film's existence?. 24 hours later I'm still scratching my head as to why it has received so little publicity considering that this is a film adaptation of a well-known play by one of South Africa's greatest playwrights, Athol Fugard. I understand the film was made on a very small budget by Hollywood standards but surely the Department of Trade and Industry, as one of the film's financier's, could've ponied up a few extra Rands to promote what is undoubtedly a well made film. If anything that would have led to more people watching it and a better return on their investment but, being a government department, that would be expecting too much from them. The funny thing is the midday show I watched on Friday at Rosebank Cinema Nouveau was even less well attended than that of the inferior Somewhere by Sofia Coppola which tells you all you need to know about how many people knew about this film. Director: Lonny Price. Screenplay: Nicky Rebello based on the play "Master Harold... And The Boys" by Athol Fugard. Producers: Michael Auret, Zaheer Goodman-Bhyat, Nelle Nugent and David Pupkewitz. Executive Producers: George Belshaw, Raimund Berens, Reuben Cannon, Peter Dale, John Hadity, Malcolm Kohll, Richard Paulson, Jody Price, Morris Ruskin and Kenneth Teaton. Editor: Ronelle Loots. Cinematographer: Lance Gewer. Score: Philip Miller. Distributor: Focus Features. Age Restriction: 13L. Running Time: 87 Minutes. This is a coming of age story set in Port Elizabeth in 1950 about Hally (Freddie Highmore) and the strained relationships between him and his father and the two black waiters at his mother's restaurant, Sam (Ving Rhames) and Willie (Patrick Mofokeng). Throw in the apartheid backdrop and you have the recipe for what is an interesting and challenging story about growing up white at that juncture in South Africa's history. The film itself kind of ebbs and flows between being good, very good and just plain mediocre with the main character Hally personifying this inconsistency. At best he is wise and compassionate beyond his years: the epitome of the kind of new generation of young, non-racist white South Africans that the country needed so desperately during those dark days of apartheid. At worst he may well have been Hendrik Verwoerd himself. Freddie Highmore does such an excellent job playing and balancing these two conflicting personalities that you can't help but feel sorry for Hally when he has one of his juvenile, violent outbursts. The main problem I had with the film though was that these mood swings happen far too often and after a while you stop feeling sorry for him and instead become increasingly annoyed at the him and the film itself. As a result, towards the end of the second act and all the way through the end of the third act the film starts to drag and momentum badly. It really could have used another rewrite or two to tighten up the script and perhaps add more emotional weight to the story by adding more backstory to Willie and and Hally's father. Moving swiftly along, I must say that it was a welcome surprise to see Ving Rhames in a more dramatic role although he didn't quite knock it out the park. His accent did not sound even remotely South African and he mumbled his way through the only line of vernacular that he had in the entire film. Although he did a reasonably decent acting job throughout the the film, fluffing your lines like is such an amateur thing to do that it threw me off his performance for pretty much the rest of the film. If I was the director I would have made him redo that scene over and over again until he got it right or, alternatively, just cut it out of the film altogether. However, the reality is that this film was made on too small a budget to accommodate the luxury of doing 99 takes for one scene like David Fincher did for the opening scene of The Social Network. The music and the cinematography were the two elements that I believe suffered the most due to this lack of funds. You can never fully appreciate how important a good score is to the overall feel of a film until you watch a film that has none. Try watching Inception again without the booming music and you'll see what I'm talking about. This film has barely any noticeable music to speak of and as a result there is always this nagging feeling of emptiness and incompleteness to some of the scenes that would've been easily rectified with a little bit of background music. Try watching Inception again without the booming music and you'll get the picture. The cinematographer, on the other hand, could have really used some visual effects and/or extra set designs to recreate 1950's South Africa on a larger so that he can have some expansive, panoramic views for his establishing shots. Without these he has to make do with close ups for the outdoor scenes to avoid avoid anachronistic objects like modern cars creeping into his field of view and that just didn't feel right and had the effect of creating a an unnecessary sense of claustrophobia. This in essence sums up what is wrong with this film and with the film industry in general. As much as I also enjoy fun, brainless popcorn films, most recently Fast And Furious 5, it pains me to see those films get multi-billion Rand budgets to play around with when small, deserving films like Master Harold struggle to get just a few million Rand to build basic sets. Such is life. Verdict: A beautiful coming of age story that is an absolute pleasure to behold despite it's shortcomings. 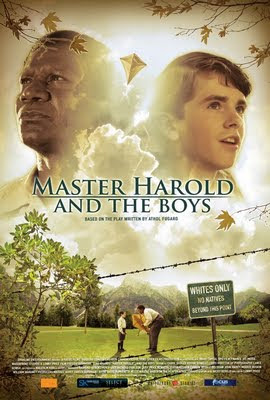 Master Harold... And The Boys is out now at selected theatres including Cinema Nouveau. What Does This Career Move Mean For Hugo Weaving? Yabba Dabba Do or Don't? Films - All About The Screenplay?